It is hard to imagine in the age of CGI animation a time in the not-to-distant past when animation was done in stop-motion photography. These films included small scale models that were moved slightly with each frame. Usually the motion was irregular and jerky because everything was done by hand. Stop-motion (or stop-action) animation was done in the late 1920's with The Lost World and King Kong in 1933. One of the early famous animators was Ray Harryhausen. You can read more about Harryhausen and the early days of animation in our art news section. In the late 1980's, the California Raison commercials made claymation popular. Previous to this, the only major claymation done was on Gumby. [Download the PDF history of Gumby ] CGI came into play with animated movies such as Toy Story, Toy Story 2 in the 1990s, and Toy Story 3 made Pixar Animation Studios a household name. With Monsters, Inc. and Finding Nemo, Pixar broke box office records for an animated film. Walt Disney Pictures and Pixar have merged and are now the largest employer of animators. Jobs at smaller studios can also be found, however. The Clayman's 3D Cartoon Communications specializes in commercial animation. Animation and Special Effects are closely related and jobs frequently overlap each other. As with jobs in Special Effects, the pay is good and qualified employees are in demand- especially in California, Florida and New York. Because everything is now computer generated, strong computer skills are essential. Many animators are creating animated gif images and Flash animations for website design. Some freelance and others work on a web development team. 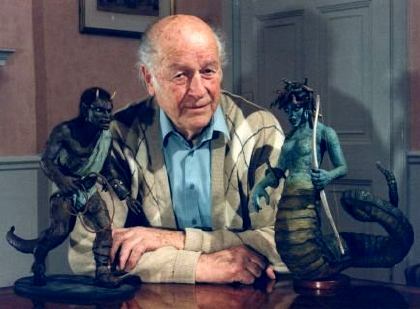 Ray Harryhausen with two of his stop-motion sculptures from the movie, "Clash of the Titans." How Do I Become a Newspaper Cartoonist? Bill Amend, the cartoonist for Foxtrot, recommends reading the book, Your Career in the Comics by Lee Nordling. He says it took him three years of submitting strips to Universal Press Syndicate before he was offered a contract. Becoming a newspaper cartoonist is next to impossible in the current world recession. Many newspaper companies are closing down. See this article for details. Sketches movement and ideas through a film. In charge of the background of the feature. A non-production background prepared by the studio for publicity or presentation purposes. Establishes direct and reflected lighting and shadow for individual shots. The technical director needs knowledge of UNIX and programming. Directs the shooting of film sequences. Makes masters from the finished film to film negative and digital cinema to high definition video. This artist frequently creates cartoons for the editorial sections of newspapers. Jobs for this profession are dwindling as newspapers fold. An original background painting used in the final version of an animated film or short. A group of original pencil drawings on one sheet that illustrate an animated character in a variety of poses and expressions. Model sheets are lithographed and distributed to the animation team to ensure a uniform look and feel to a character throughout a production. An artist who creates animated pictures transforming one image to another. Career Connections, an online job fair for the animation industry. A must-see sight! Walt Disney Studios, a listing of jobs available through a jobs telephone line. There are thousands of artists and companies in the world and the list is too comprehensive to include here. You can do a search for companies on major search engines. P.T. Pie, which creates digital cartoons. The Animation Guild- Local 839's website. You can apply for grants and network with many members who are currently working for major production companies.